Introduction: Use of medicinal plants to cure diseases has been practiced throughout the world. This is more common among the rural population as the reach of modern health-care facility is very little toward them. Rural population treats or manages different oral disease with the locally available herbs, which has been used traditionally. Among them, tulsi, neem, and Pochotia are most commonly used herbs in Assam. Aim: The aim of the study was to find out antibacterial and antifungal properties of Tulsi, Neem, and Posotia against few isolated oral microbes. 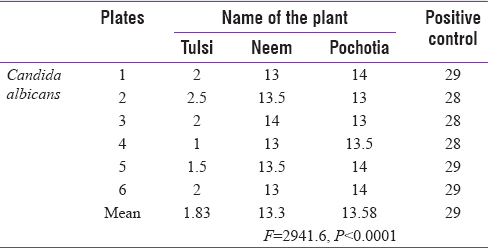 Materials and Methods: Three commonly used plants – tulsi, neem, and Pochotia taken for antimicrobial study. Twigs dried and powdered and extract made with water and acetone. Microorganisms were isolated from the oral swab taken from the patient attending Out Patient Department of Regional Dental College, Guwahati. Antibacterial and antifungal potential of these plants was observed using agar well-diffusion method. Results: Tulsi and Pochotia showed antibacterial activity against Streptococcus mitis and Streptococcus viridans, whereas neem extract showed inhibitory effect against Klebsiella species. Neem and Pochotia showed antifungal action against Candida albican in both aqueous and acetone extract. The positive control of ciprofloxacin and itraconazole produced significant size of the inhibition zone. Statistical analysis was done using Instat Software. For comparing means, F-test was applied and considered P < 0.05 to be significant. Conclusion: Antimicrobial essay showed the antibacterial and antifungal action of these plants against oral microbes. It is important to identify and isolate the proper constituent responsible for this mechanism. The use of herbs and plants for cleaning teeth and treating different oral diseases has been practiced in India since time immemorial. Plants are used medicinally in different countries and are a source of many potent and powerful drugs. Parts of a plant have been in use for various ailments in different localities. It has also been in use as traditional toothbrush or chewing stick, known as datun, by different population of India. The use of these plants varies according to individual preferences, culture, and availability of these plants in that locality. Although hundreds of plant species have been tested for antimicrobial properties, the vast majority of them have not been adequately evaluated. The use of tulsi (Ocimum sanctum), neem (Azadirachta indica), and Pochotia (Vitex negundo) as traditional medicine in India is a common practice. Tulsi is a small aromatic plant, subshrub of Lamiaceae family. Due to its many health benefit, Tulsi is considered as “queen of herbs.” Neem is one of the most widely researched tropical trees. It is an aromatic tree and is used to control pain, inflammation, and other related diseases in Ayurveda. Pochotia or V. nigundo Linn. belongs to Verbenaceae family is a woody aromatic and medicinal shrub or a small tree is most commonly used in folk medicine. In Ayurveda, it is used as anti-inflammatory, analgesic, and anti-itching agent. The mouth harbors a diverse, abundant, and complex microbial community. It has been calculated that a human adult houses about 1010 bacteria in the mouth. It includes streptococci, lactobacilli, staphylococci, and corynebacteria, with a great number of anaerobes, especially bacteroides. To combat with different diseases caused by these organisms, antibacterial property from diverse sources plays a very important role. Among the sources, plant appears to have valuable antibacterial sources. Considering the low adherence to antimicrobial drugs, high cost on treatment, and high degree of drug resistance, the present study was undertaken to find out the antibacterial and antifungal property of these plants against few oral microbes. This hospital-based, cross-sectional study was conducted among the patient attending the Outpatient Department (OPD) of Regional Dental College, Guwahati, in the month of September and October 2015. Initially, leaves from tulsi, neem, and Pochotia were collected separately and washed thoroughly with tap water followed by distilled water. The leaves were left for drying in shade for 5 days. Following this, extract was prepared and grouped. Air dried 10 g powdered material mixed with 100 ml distilled water for Group A and for Group B mixed with 100 ml acetone. Using Whatman no. 1 filter paper, the extracts from both groups were filtered. The extracts were then evaporated in evaporator. After evaporation of solvents, extracts were stored in refrigerator at 4°C until further use. The organisms were subcultured in blood agar and MacConkey agar media and incubated overnight at 37°C. The study population comprised of patients aged 20–40 years of age and who were willing to participate. Informed consent was taken from each participant before the study. A total of 100 swabs were taken during the study period, and an average three swabs were taken from each OPD day. Following these, organisms were isolated in the Department of Microbiology, Gauhati Medical College, Assam. The antimicrobial activity was determined using agar well-diffusion method. Ciprofloxacin (5 μg) disc was used as positive control. In case of Candida albicans, positive control was done with itraconazole disc. Pure isolates of bacteria (3–5 isolated colonies) were subcultured in peptone water and incubated for 4 h. The density of each microbial suspension was adjusted to 0.5 McFarland turbidity standards which correspond to 106 (CFU/ml). Muller-Hinton agar with 5% sheep blood was used for Streptococcus species, and for Klebsiella species, Muller-Hinton agar was used. Agar plates were prepared, and 100 μl of each inoculum was spread on agar plates and allowed to dry. Five wells were made with the help of sterile borer in each plate. 100 μl of each plant extract was then poured into the wells with the help of micropipette. Plates were incubated at 37°C for 24 h.
The experiment was performed in duplicates and mean values of the diameter of inhibition zones were calculated. Statistical analysis was done using Instat Software, Graphpad Software Inc, USA. For comparing means, F-test was applied and considered P < 0.05 to be significant. In this study, three medicinal plants – tulsi, neem, or/and Pochotia were tested against four isolated oral microorganisms from oral cavity: Streptococcus mitis, Streptococcus viridans, Klebsiella species, and C. albicans. The results of antimicrobial assay of three different medicinal leaves' extract prepared from water and acetone based were compared with ciprofloxacin as a positive control and for antifungal activity itraconazole as a positive control. 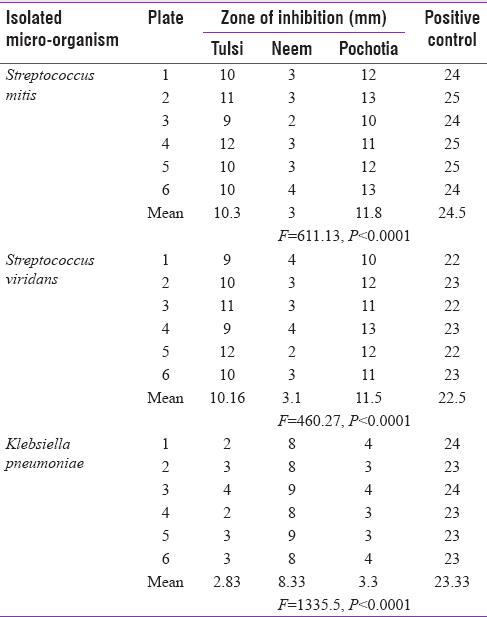 From the [Table 1] and [Table 2], it is clearly evident that the extract of tulsi and Pochotia showed antibacterial activity against Gram-positive bacteria like S. mitis and S. viridans, whereas Neem extract showed inhibitory effect against Gram-negative bacteria such as Klebsiella species. Neem and Pochotia showed antifungal action against C. albicans in both groups [Table 3] and [Table 4]. The positive control of ciprofloxacin and itraconazole produced the significant size of the inhibition zone. Oral health-care products have gained considerable significance in recent years for its role in the improvement of oral hygiene. Antibacterial agents are usually included into these products for the treatment and prevention of oral diseases. Due to rapid appearance of multiple drug-resistant bacteria, there is a continuous need of new antibacterial components. In the present study, 10% of both aqueous and acetone extract of Neem tree twigs has shown 8.33 and 15.1 mm zone of inhibition, respectively, against Klebsiella species. Similar results were also found by Chaturvedi et al., against Klebsiella sp., in various concentration of aqueous extract of Neem. Pretreatment of saliva-conditioned hydroxyapatite with neem-stick extract before exposure to bacteria showed a significant reduction in bacterial adhesion. 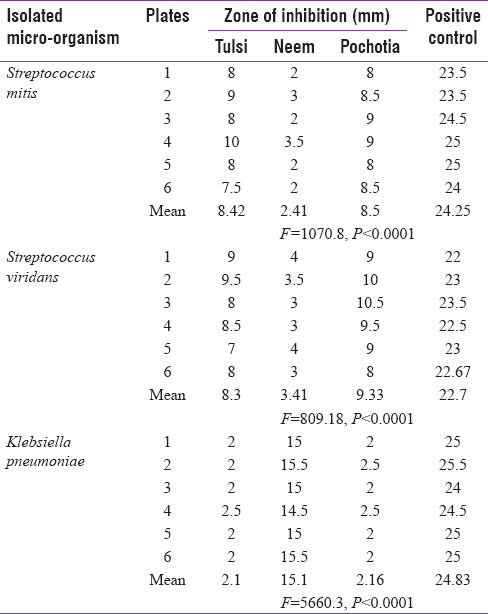 A clinical study of a mucoadhesive dental gel containing an extract of A. indica (Meliaceae) involving 36 participants showed a significant reduction in salivary Streptococcus mutans and Lactobacillus sp. bacterial counts after 6 weeks. The present study showed antifungal activity of neem tree against C. albicans with a zone of inhibition of 9.83 and 13.30 mm, respectively, in aqueous and acetone extract. Mahammd Asif reported that neem tree oil showed considerable activity against C. albicans. The presence of alkaloids, glycosides, saponins, steroids, phenols, flavonoids, and tannins have a physiological action on the living system and constituents such as saponins, triterpenoids, alkaloids, tannins, glycosides, and steroids may be responsible for the broad range of medicinal properties of neem independently or in combination. Tulsi showed only 2.83 mm zone of inhibition against Klebsiella species. Rathod et al. 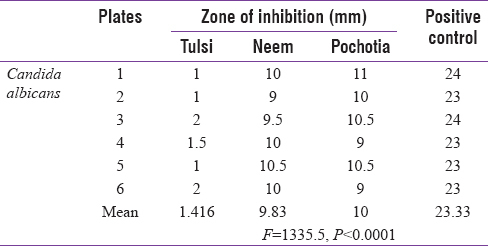 reported slightly higher inhibition zone in a higher concentration of tulsi extract, whereas Prasannabalaji et al. observed no inhibition zone of tulsi in both water and acetone extract. In the present study, tulsi and Posotia showed significant antibacterial activity against S. mitis and S. viridans. Similar finding of antibacterial activity of Tulsi against S. mutans was also reported by Mistry et al., The antimicrobial efficacy of tulsi or O. sanctum was may be due to the presence of Vitamin C, tannins, and traces of maleic, citric, oleanolic, ursolic, and tartaric acids. Oil from the leaves, seeds, and bark said to possess a wide spectrum of antibacterial action against Gram-negative and Gram-positive microorganism. The antimicrobial efficacy of O. sanctum was mainly attributed to the presence of eugenol. Apart from this, the other important constituents claimed to be responsible antimicrobial efficacy were ursolic acid and carvacrol. The extracts of A. indica and O. sanctum have all been found to inhibit certain dental caries and periodontal pathogens. In the present study, Pochotia showed significant antibacterial activity against S. mitis, S. viridans, and antifungal activity against C. albicans. Prominent antibacterial activity of Posotiya against Staphylococcus aureus, Bacillus subtilis, Escherichia More Details coli, and Pseudomonas aeruginosa strains was also observed by Khokra et al. Antibacterial constituents among these parts of a tree such as a root, stem bark, and leaf may differ and stem bark found to contain more antibacterial properties than the others. Traditionally, many plant parts are used for the medicinal purpose to cure or prevent different oral diseases. Evaluation of the specific plant or the constituent is very much essential, as incorporation of these constituents in oral health-care products will help to prevent oral diseases. This study has confirmed that the antibacterial potentials of these plants can be used as a preventive measure for different microbial disease of oral cavity. It provides the base to use the natural products for its antibacterial activity. Further studies are required in different concentration to substantiate the use of the plant extracts to replace synthetic medication with natural remedies. Balandrin MF, Klocke JA, Wurtele ES, Bollinger WH. Natural plant chemicals: Sources of industrial and medicinal materials. Science 1985;228:1154-60. Perakath V, Lakshmanan R. Tulsi-The matchless medicinal herb. IOSR J Dent Med Sci 2014;13:51-5. Vanka A, Tandon S, Rao SR, Udupa N, Ramkumar P. The effect of indigenous neem Azadirachta indica [correction of (Adirachta indica)] mouth wash on Streptococcus mutans and lactobacilli growth. Indian J Dent Res 2001;12:133-44. Murugesan D, Deviponnuswamy R. Potential anti-inflammatory medicinal plants – A review. Int J Pharm Pharm Sci 2014;6:43-9. Kenneth T. Todar's Online Textbook of Bacteriology. The Bacterial Flora of Humans. Madison, Wisconsin-53706; 2008-2012. Available from: http://www.textbookofbacteriology.net. [Last accessed on 2018 Aug 04]. Deshpande RR, Kale AA, Ruikar AD. Antimicrobial activity of different extracts of Juglans regia L. against oral microflora. Int J Pharm Pharm Sci 2011;3:200-1. Chaturvedi P, Bag A, Rawat V, Jyala NS, Satyavali V, Jha PK. Antibacterial effects of Azadirachta indica leaf and bark extracts in clinical isolates of diabetic patients. Natl J Integr Res Med 2011;2:5-9. Wolinsky LE, Mania S, Nachnani S, Ling S. The inhibiting effect of aqueous Azadirachta indica (Neem) extract upon bacterial properties influencing in vitro plaque formation. J Dent Res 1996;75:816-22. Pai MR, Acharya LD, Udupa N. Evaluation of antiplaque activity of Azadirachta indica leaf extract gel – A 6-week clinical study. J Ethnopharmacol 2004;90:99-103. Asif M. A review on spermicidal activities of Azadirachita indica. J Pharmacogn Phytochem 2013;1:61-79. Pandey G, Verma KK, Singh M. Evaluation of phytochemical, antibacterial and free radical scavenging properties of Azadirachta indica (neem) leaves. Int J Pharm Pharm Sci 2014;6:444-7. Rathod GP, Kotecha BM, Sharma R, Amin H, Prajapati PK.In vitro antibacterial study of two commonly used medicinal plants in ayurveda: Neem (Azadirachta indica L.) and Tulsi (Ocimum sanctum L.). Int J Pharm Biol Arch 2012;3:582-6. Prasannabalaji N, Muralidharan G, Sivandan RN, Kumaron S, Pugazhvendan SR. Antibacterial activities of some Indian traditional plant extracts. Asian Pac J Trop Dis 2012;2:S291-5. Mistry KS, Sanghvi Z, Parmar G, Shah S. The antimicrobial activity of Azadirachta indica, Mimusops elengi, Tinospora cardifolia, Ocimum sanctum and 2% chlorhexidine gluconate on common endodontic pathogens: An in vitro study. Eur J Dent 2014;8:172-7. Chopra RN, Nayar SL, Chopra IC, Asolkar LV, Kakkar KK. Glossary of Indian Medicinal Plants. New Delhi: Council of Scientific and Industrial Research; 1956. Agarwal P, Nagesh L, Murlikrishnan. Evaluation of the antimicrobial activity of various concentrations of tulsi (Ocimum sanctum) extract against Streptococcus mutans: An in vitro study. Indian J Dent Res 2010;21:357-9. Chandra Shekar BR, Nagarajappa R, Suma S, Thakur R. Herbal extracts in oral health care – A review of the current scenario and its future needs. Pharmacogn Rev 2015;9:87-92. Khokra SL, Prakash O, Jain S, Aneja KR, Dhingra Y. Essential oil composition and antibacterial studies of Vitex negundo linn. Extracts. Indian J Pharm Sci 2008;70:522-6. Adeshina GO, Onujagbe OM, Onaolapo JA. Comparative antibacterial studies on the root, stem bark and leaf extracts of Parkia clappertoniana. Internet J Alter Med2009;8(2):1-7. online [doi: 10.5580/298a].